Pipes: Huntington "made some very major mistakes." 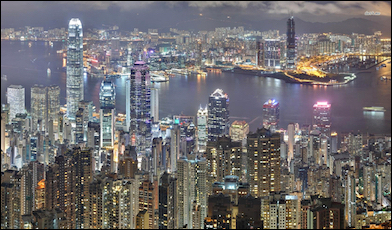 The Hong Kong skyline: No one any more sees Confucianism as an obstacle to development. Today, however, East Asia and India are economic powerhouses and many people perceive Confucianism and Hinduism as drivers of this success story. Could the same happen with Islam, that it will also reform? DP: Yes, it is possible that Muslim peoples will recover from today's predicament and go on to economic and political success. We have no way of predicting such things. And no civilization or religion stays permanently down. GR: There is a broad spectrum of Islamists. Al-Qaida, the Islamic State, Boko Haram, Al Shabaab, which want to occupy territory by military means and create an ever expanding state. And then the Muslim Brotherhood, the Turkish AK Party and the Iranian Khomeinists. Which of these Islamist groups are the greatest danger for the West and which of these concepts do you think will be the most successful? DP: I worry the most about the subtle, infiltrating Islamists. When it comes to force, we can easily defeat them. But when it comes to our own institutions – schools, law courts, media, parliaments – we are far less prepared to defend ourselves. DP: I do not recognize the term "Islamophobe" and do not know what it means except, in the immortal phrase of Andrew Cummins as a word "created by fascists and used by cowards to manipulate morons." "Islamist ideology breeds Islamist violence, which ... in turn inspires anti-Islamic sentiments." Your question reverses the sequence of events. Islamist ideology breeds Islamist violence, which starts the process and in turn inspires anti-Islamic sentiments. Anti-Islamic views might also inspire more Islamist violence, but that is incidental. The real dynamic here is Islamism creating anti-Islam parties. As Norbert Hofer has shown in Austria, they are approaching 50 percent of the vote and with it, political power. GR: Focusing on the "Islamophobic" parties opposition to Islam ignores that they are largely semi-fascist. Geert Wilders says that the Koran is comparable to Hitler's Mein Kampf and that Islam is a totalitarian ideology. Can he be an ally in the fight against Islamism? Maybe Obama and Merkel are weak on Islamism, but do you support Wilders, Trump, Austria's FPÖ, Hungary's Fidesz or Jobbik? ​DP: Anti-Islamic leaders and parties are unsophisticated and make many mistakes. I hope that, as they get closer to power, they will get more educated and serious. I do not support them but I do give them advice. GR: The failed coup in Turkey helped [Turkish President Recep Tayyip] Erdoğan establish his Islamist dictatorship. Do you think NATO will accept an Islamofascist dictatorship as a member state? Some experts say that Saudi Arabia is also a Islamist dictatorship, but a partner of the USA and the West. Therefore realpolitik will prevail. How do you think the relations between Erdogan-Turkey and the West will develop? 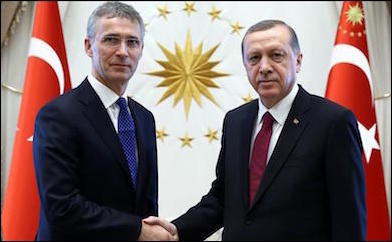 Turkish President Recep Tayyip Erdogan (right) and NATO Secretary General Jens Stoltenberg in Ankara on April 21, 2016. DP: As I understand it, NATO has no mechanism to expel a member state; if that is accurate, it has no choice but to work with Erdoğan. In the brief period since the coup attempt, Erdoğan has been very hostile to the West. Perhaps he will end up in the Shanghai Cooperation Organisation. 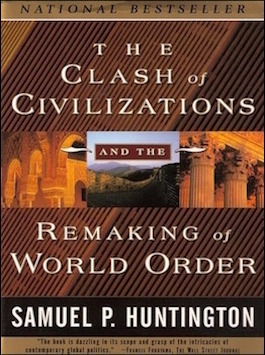 GR: Besides Islamists, the West has to deal with Russia, China, and North Korea. How can it deal with all these challenges at the same time? Which counter-jihadi strategy do you find most promising? DP: The strategic environment today is far easier than during the cold war; there is no determined ideological enemy with the tools of a great power at its disposal. The key is for the West not to go to sleep. Electing such leaders as Obama and Merkel, however, means going to sleep. The best counter-jihadi strategy is one that takes ideas seriously. GR: It took the West two decades to get rid of fascism and 70 years to get rid of communism. How long do you think will it take to get rid of Islamism? Are we facing the zenith of Islamism right now or are we just halfway up the road and will it get even worse? DP: The battle against Islamism has not yet started. I cannot predict how long it will take. It's still pre-1945 in communist terms and the 1930s in fascist terms. I see Islamism as having peaked in 2012-13 and showing signs of weakness. GR: Will the bad experience with Islamism and secular military dictatorships in Muslim countries create a new democratic movement and a new Muslim spring in the future after a catharsis? Or do you think these countries are all failed countries which will disintegrate because they are incapable of changing course? DP: Muslims are learning bitter lessons from the Islamist experience. I hope they will put these to good use, though so far there is very little evidence of this happening.